This colour atlas presents clinicians with the latest techniques for the diagnosis and treatment of heart disorders. Divided into sections dedicated to a specific area of the heart, each topic begins with discussion on normal anatomy, function and pathology. Diseases and disorders associated with that region are then described in depth. Both well established and emerging device-based therapies are covered, as well as cutting edge imaging techniques including 3D echocardiography, 4D MRI, optical coherence tomography, and ECG mapping. American and European practice guidelines for the management of specific cardiovascular diseases are also summarised. 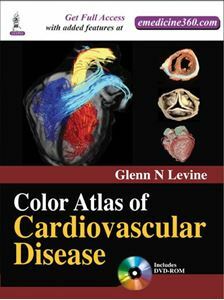 Edited by Houston-based specialist, Glenn N Levine, and with contributions from more than 150 internationally recognised cardiovascular experts, this comprehensive manual contains more than 3000 digital images covering gross and microscopic pathology, schematic figures and numerous tables and flow charts. A DVD ROM illustrating imaging results is also included. Chapters 1, 2, 5 to 18, 20 to 22, 24, 29, 36, 37, 39, 40 to 43, 46, 49, 51, 54, 57 and 58 contain video(s).